Children are built and hard-wired to move. 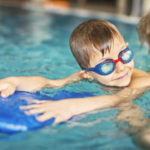 Physical activity is good for their bodies and minds. Moving helps everyone feel good and it supports the healthy development of our entire bodies: hearts, lungs, muscles, bones and mind. 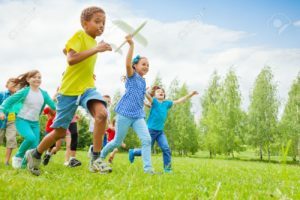 All children need and benefit from at least 60 minutes of physical activity every day. You can help your children reach this goal by adding to the active play that you already do as a part of the daily routine. Add several 10-15 minute bursts of activity to each day – it makes a difference! Play games together and provide developmentally-appropriate toys such as balls, push and pull toys and ride-on vehicles. Create opportunities for building strength by including some heavy work such as pulling a loaded wagon, carrying a bucket of dirt or water to the garden, or pushing a kid-sized wheelbarrow with plants in it. Take your shoes off and run around in the fresh green grass! Kids who like to engage in active play now are likely to stay active and be physically fit in the future. Staying fit can improve self-esteem, help maintain a healthy weight and decrease the risk of serious illnesses, such as high blood pressure, diabetes and heart disease. You can make your child a fun rainbow prop to use while dancing around the room. For this activity you will need a small margarine or cottage cheese plastic lid and some tissue paper strips or ribbons. First, take the lid and cut out the center, leaving a plastic ring or use shower rings. 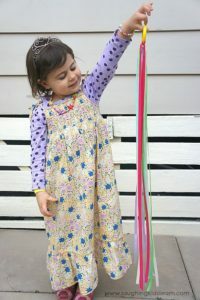 Next, cut 1´x 24” streamers, one red, one orange, one yellow, one green, one blue and one purple or purchase small colorful ribbons. Tape or glue the streamers or ribbons around the rim on one side of the plastic ring. Give the ring to your child and have them hold it on the side of the ring without the streamers. Have your child notice how the streamers fly out behind them as they run or dance around. Tape circles of paper or cardboard on the floor and jump from one to another. Put on a raincoat and galoshes and go outside to jump in a real puddle! Sit on the floor facing your child with feet touching. Hold hands and lean forwards and backwards as you and your child sing “Row, row, row your boat, over the water blue. First go forward, then go back, together me and you. Row, row, row your boat, singing as we go. Going out over the waves, rowing fast, then slow!” Change up the tempo and the movements! Help your child name the body parts as he/she moves. As your child is picking up their toys, call out the name of a fast-moving creature like a bee. As you are getting ready for bed, you might move like an elephant or a turtle to help your child calm down. Cut animal pictures from magazines and glue to index cards or have your child draw animals on index cards. Put all of the cards in a paper bag; now you have a fun movement activity. At different times during the day, ask your child to choose an animal card from the bag. Move like this animal. Children love to get into things and their curiosity drives them to explore. Help them investigate and identify by touching different shapes and textures in a game of seek and find. Gather a variety of household objects, food and toys, and place them one at a time into a pillow case or drawstring bag. Ask your child to reach into the bag (no peeking!) and feel the object. Then ask him to guess what it is. If he can’t tell you, you can describe the object for him. Take it out to show him before he grows too frustrated. Talk about how the object feels: introduce the concepts of hard, soft, rough, fuzzy, squishy, cold, smooth, round, and square. Take turns hiding and finding the objects. Dance to lively music and when the music is paused, everyone has to find a partner to hug. The more people in this game the more fun it is. 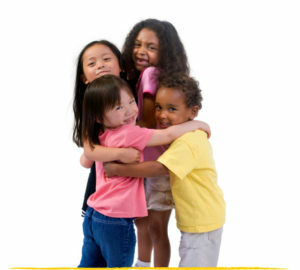 Often 2, 3, or more children hug each other, until the music is turned back on. Then dance again, until the next pause in the music. Very fun! This activity encourages listening and promotes socialization and cooperation. 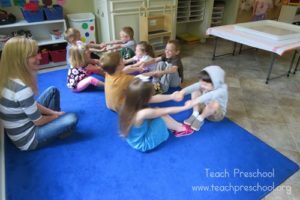 Our favorite books about movement!